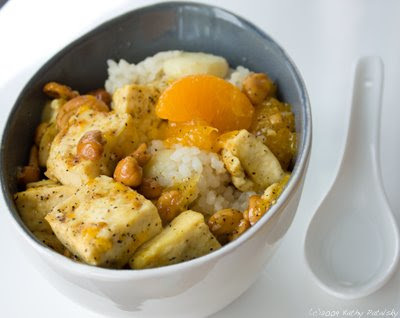 Recipe: Ginger Mandarin Rice with Cashew Tofu. Sweet. 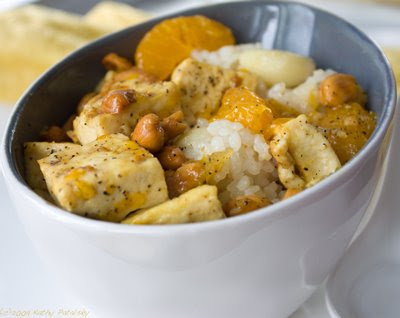 Tofu and rice doesn't have to just be tofu and rice. Take it to the next level with fresh flavors and healthy ingredients. This recipe is super easy, vegan comfort food. Canned Mandarins. Who Knew?! 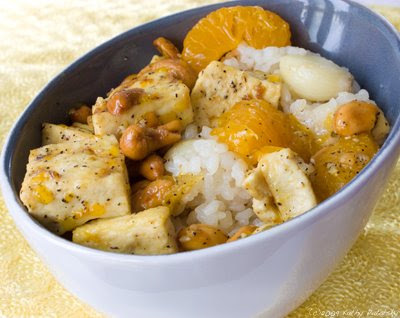 This recipe uses a can of mandarin oranges as a main ingredient - both the fruit and the canning juice are used to flavor the tofu and plump the rice. High in vitamin C and sweetly healthy, I love the delicate flavor of mandarins. Smells Healthy! 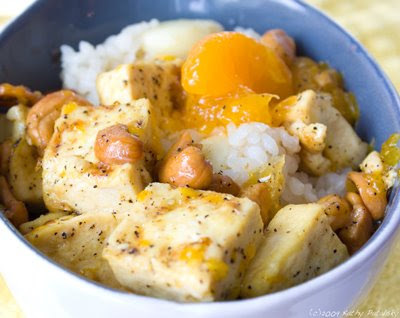 No surprise: rice and tofu is a healthy dish. But you can easily make it super healthy and super flavorful by adding in a few antioxidant-rich, wellness food flavors like garlic and ginger. This G & G combo will go right to your nose and perk up the gloomiest of days. 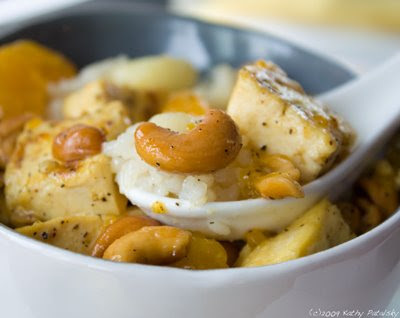 Cashew nuts add an extra dose of nutrients and healthy fats. And don't forget the tofu! 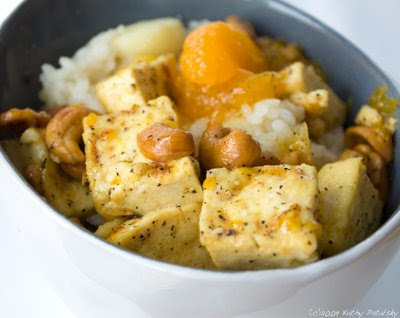 High in vegan protein, tofu makes any dish divine and satisfying. In a soup pan bring 1 1/2 cups of water to a boil. Ad rice and 1 tsp garlic salt. Reduce heat and cover pan. Let simmer for 15 minutes until liquid is absorbed. Add in 1/4 cup of the mandarin juice, the chopped ginger, 2 cloves of garlic, 1 Tbsp agave syrup, 3 whole mandarin slices and a dash of black pepper. Cover pan and continue to heat for a few minutes until liquid is absorbed again. Remove lid and saute rice on high for about a minute. Move to bowl and toss with rice vinegar. 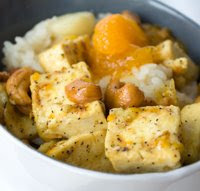 Add chopped tofu, remaining garlic, 3 Tbsp mandarin juice and 1 tsp garlic salt. Cover lid and let heat and steam for a few minutes. Continue sauteing ingredients until tofu looks fluffy, but not too browned. Add cashews and recover pan for a few more minutes to cook. 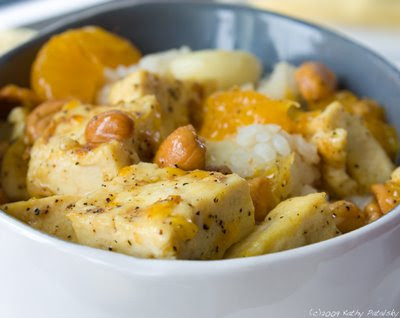 When tofu is browned and fluffy and cashews begin to darken, your tofu is done. *make sure all the liquid is absorbed. 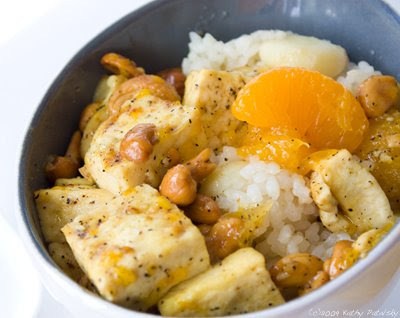 Spoon tofu over rice and garnish with raw mandarin orange slices. Add fresh ground black pepper. Serve hot in a nice little bowl.